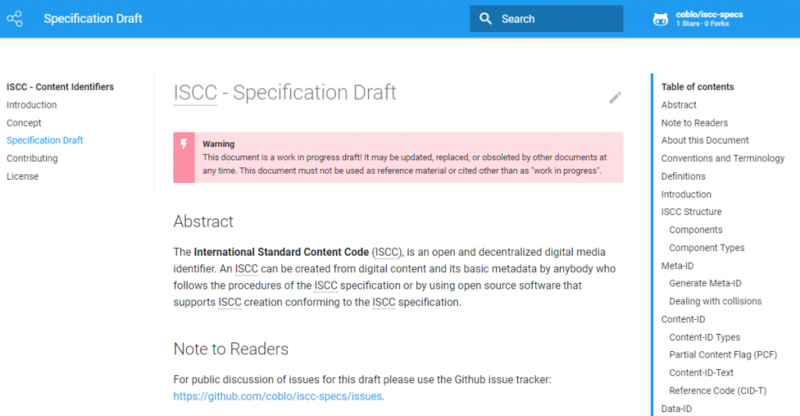 Based on our prototyping code we have also published the first draft of the specifications for the ISCC. The Specification is developed in a public github repository and the current status is published at http://iscc.codes/specification/. One of our goals for the final specification is to make it as easy as possible for developers to implement ISCC code generation in different programming languages. This also means that we cannot use existent, convenient high level libraries as dependencies as they are likely to be only available in one programming language. Instead we need to deliver simple reference implementations for all logic involved with the creation of ISCC identifiers. We will keep fleshing out the specification with diagrams, reference code, and test vectors in the upcoming months.